Would you like to live right in the center of the Stadshart (city center) of Lelystad? Now you can! 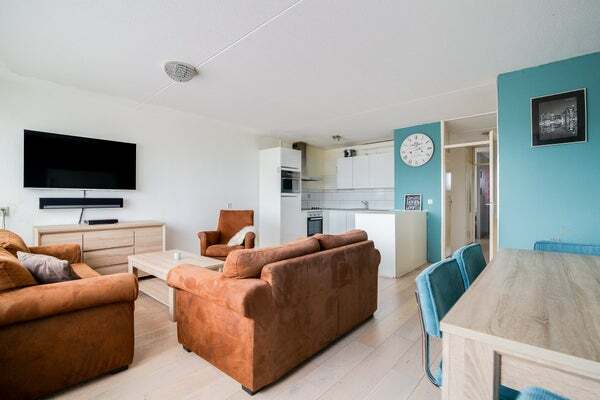 Including all facilities like shops, Lelystad Central Station for train and bus, nightlife opportunities and various cafés and restaurants, all at walking distance. This bright, ready-to-move-in, furnished 2-room apartment of 72m2 lies on the 1st and 2nd floor of apartment complex ‘de Agorahof’ and includes a dedicated storage, spacious living room with large balcony, open kitchen with various built-in appliances, a large bedroom with convenient divider for potential kids room or office space, and a bathroom with a beautiful bathtub. Private entry with mailboxes (so only accessible for residents), central hall with elevator and staircase. Gallery, front door, entrance hall, electricity meter cupboard, dedicated storage room, staircase to 2nd floor. Stairs end in a hallway. On the left side lies the gorgeous living room with open kitchen and built-in appliances (refrigerator, microwave, dishwasher and oven with electric stove). Direct access from the living room to the balcony facing the South-East. On the other side of the hallway lies the large bedroom, which through a practical divider wall provides an enclosed area that perfectly serves as a children’s bedroom or office space. Toilet and boiler cupboard also accessible from the hallway. The bathroom is accessed from the bedroom and includes a beautiful bathtub with shower, washbashin, radiator and connection for laundry machine/drier. The entire apartment is equipped with lovely wooden flooring. There is a large dedicated storage right next to the apartment (e.g. to store your bicycle), accessible from both front- and backside.